The peplos kore (maiden) is in all the art history books. She was sculpted ca. 530 as a gift for the goddess Athena and placed on the Athenian acropolis. Traces of the original paint linger on her eyes, lips and hair. Her smile is subtle and sweet. Peplos kore, Acropolis Museum, Athens. Andy read Max’s letters starting from the earliest, which dated to the brief period after Max had left for England and before she’d taken the connoisseurship class with John. It was like opening up a door into the past, into things she never dreamed she would know about Max and his life. The letters were exquisite, witty, tasteful. Even as a young man, he had been remarkably discerning when it came to aesthetic matters, and passionate. That was part of why John loved him, she thought. John’s was a more cerebral personality, but he was attracted to fiery people. Including me? I never thought of myself that way. The letters had arrived every six months or so. They mostly dealt with his interior life, the books he read, the paintings he saw, the music he heard. Occasionally, however, there was news. He was seeing a woman, Sandra, a mathematician whose stunning blonde beauty was matched by her keen intellect. They were engaged. Max was hired at Boston University, then became a Fellow of All Souls college at Oxford. He married Sandra, and they had a son. He moved to a senior position at NYU. He received the Macarthur “genius” fellowship for his work on the role of connoisseurship in the modern world, and his publications identifying certain celebrated “Minoan” sculptures as fakes. Then came the accident in which Sandra was injured. Andy read on, and on, breathlessly following the story, weeping as she felt his anguish through the cramped handwriting on the pages. Sandra might not survive. Traumatic brain injury. Reconstructive surgery to repair the crushed bones in her right cheek, her nose, her chin. A second surgery to her ear, and rehab to help her regain her cognitive faculties. A second leave of absence from NYU, so he could work with her, see her every day. Sandra’s recovery; her beauty restored through the diligent work of the surgeons, her physical health excellent. Her love of trips to Manhattan, to walk in Central Park or on the High Line. Her knowledge of mathematics, and her long-term memory, gone forever. Her short-term memory, seriously impaired. And, in the last letter, dated almost five years ago, Max’s forlorn, fading hope that somehow, Sandra would eventually come to remember him, and their son, and their life together. Margaret was unperturbed. My mother embodied many feminist ideals, but always strenuously disavowed that label. “Your name means Ruler of Men,” she answered calmly. “You ought to be grateful I gave you such a lovely name. I could have called you Gorgophone.” That was Andromeda and Perseus’ daughter. “Andromeda’s mother was punished for hubris,” I told her. “And yet, she’s now a constellation in the heavens,” she answered dreamily, turning to her telescope. There was no arguing with her. There still isn’t. Andromeda’s father was the King of Ethiopia, and I knew my mother had traveled to Africa in her youth, when she suddenly became smitten with ancient Coptic Christianity. At the age of twelve, I even entertained a theory that, through some bizarre chain of events contrived by the enigmatic Margaret, my father was actually Haile Selassie I.
I allowed John to call me Andromeda, but I encourage everyone else to call me Andy. People with too much education assume I’m a Greek, because I have Mediterranean skin and black wavy hair. People with too little education can’t fit their mouths around the name. And as for the name Whipple, during my childhood it gave rise to an endless series of toilet paper jokes, which only grew worse as my breasts began to grow. Walking down the hallway of my high school, I often heard sniggers about “squeezing the Charmin.” So it was that, much to my mother’s dismay, I willingly changed my name to Andromeda Elliott when I married. Notes: This story has more serious and sad themes than most of my fiction. Except for my novel about the Irish hero Cúchulainn, it’s the most “literary” thing I’ve written. Andy spent much of her childhood wondering who her father was, something that I can identify with. As a child I barely knew mine, so I made up personalities for him. With very few clues from her mother, Andy theorized that her dark Mediterranean looks came from Margaret’s time in Ethiopia. One of her wilder fantasies! 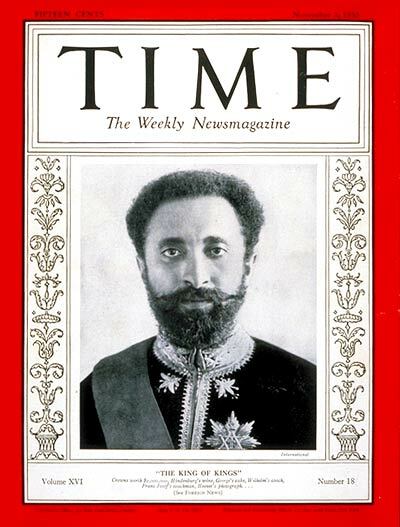 Ras Tafari or Haile Selassie I, emperor of Ethiopia (born 1892, died 1975). Andy complains about the myth of Andromeda, who is chained to a rock (invariably naked) to be eaten by a sea monster. Of course, she’s rescued by Perseus (or in a later version of the story, a hero with the unheroic name of “Roger”). Ingres’ version of the story from “Orlando Furioso”: Roger rescuing the heroine from a rather limp sea monster. The writing of letters by hand has become a lost art. Andy and Max are in their 40s, and they belong to what is probably the last full generation of letter-writers. John, of course, was devoted to handwritten communications and understood their aesthetic and emotional value. It was the natural mode of discourse between him and Max during their long friendship. I am more than happy to get my brainbox to ‘work a little harder’ reading this story. How I miss letter writing, something I did a lot of as a child and adolescent. A dying art indeed. 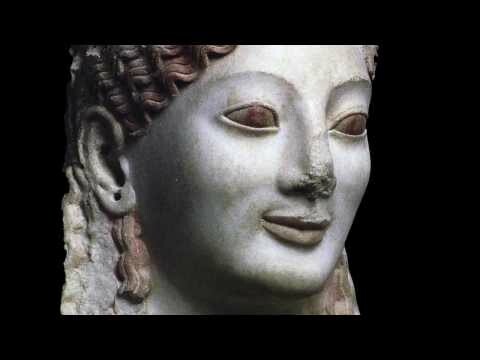 I love the lady kore at the Acropolis, i really really liked her in person as well, somehow that smile makes a very intelligent face. I think the letter idea is very clever, Andy finding out about Max this way is nice and sad at the same time but i think it makes her reconnect with a more human and complex version of him than the one which irritated her. I love the korai too. The Archaic period is my favorite in Greek sculpture, because it has a charm that the later more “perfect” statues lack. I never had calligraphy lessons, though I was taught cursive penmanship. I failed to excel in that subject and my handwriting still varies wildly according to mood. As a girl, I loved letter-writing and stationery and pens and stamps. I agree, I’m glad that I’m old enough to remember the excitement of it. I have a friend who lived in Rome off and on for years, and I’m sure she mentioned that shop near the Pantheon!